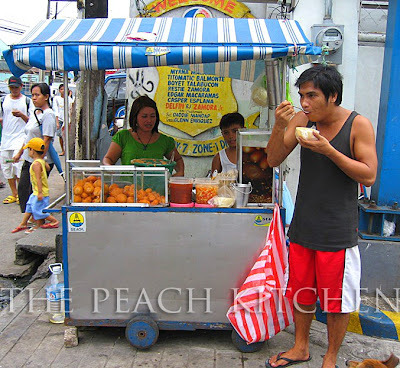 Tukneneng and Kwek-Kwek are egg street foods commonly sold all over the Philippines.Tukneneng are soft boiled quail eggs dipped in batter that is usually dyed orange then deep fried in oil while Kwek-Kwek are chicken eggs prepared the same as tukneneng. 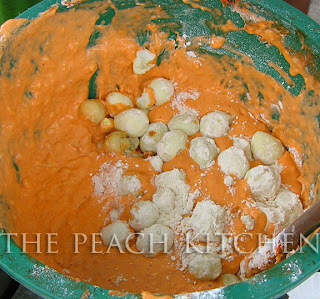 Here is a small bucket with the orange-colored batter. The quail eggs are rolled into flour before they are dipped into the batter. 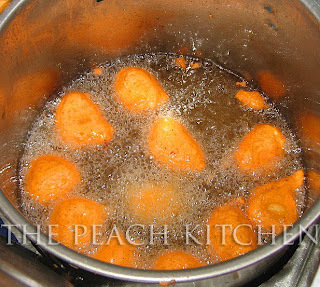 Then they are deep-fried into hot oil. There are two kinds of sauce to choose from. The first sauce is the sweet and sour sauce and the sauce on the right is vinegar with chopped onions, chopped cucumber and bird’s eye chili. I like combining the sauce for my tukneneng. It’s gives a sweet,sour,spicy and cucumber-y taste. 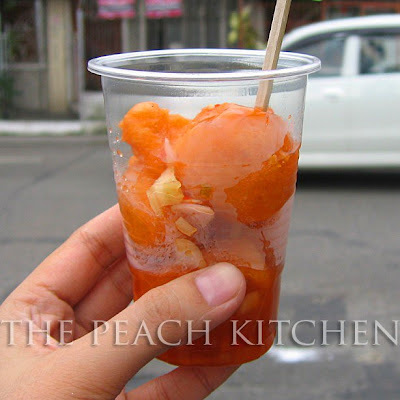 This Kwek-Kwek has lots of chopped onions and cucumbers on top. 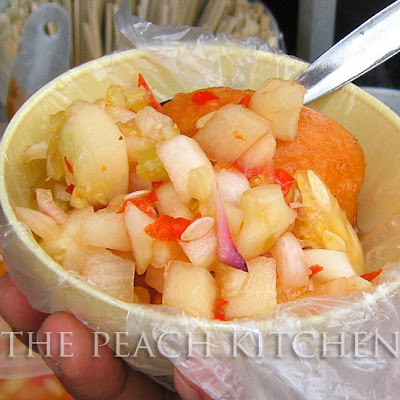 When it is eaten beside the stall (for here), it is put into a plastic bowl and you’ll be given a spoon. After eating you have to return the bowl. This is my order. Four pieces of Tukneneng to go. 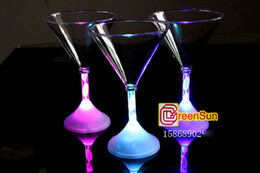 It’s either in a plastic cup or a small paper tray and you’ll have a wooden stick to to eat it. 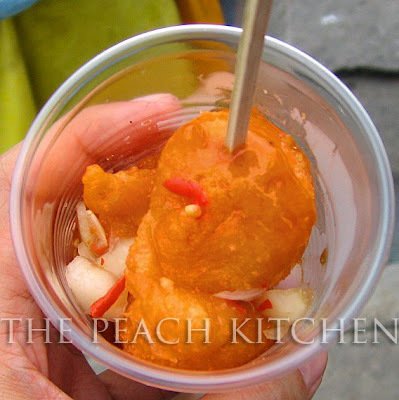 Imagine sinking your teeth into a soft,warm batter with sweet,sour and spicy goodness followed by the creaminess of the egg…. If you get thirsty, by the way, this little stall sells drinks for P5 per cup. 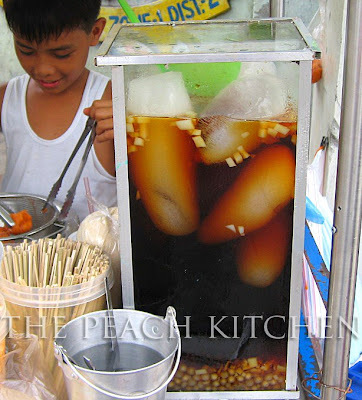 That’s a sweetened drink with jellies and tapioca pearls. The boy in the picture is one of my best customer at the internet café. This is the little store famous for their Tukneneng. 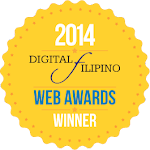 An entry for . Have a great weekend everyone!